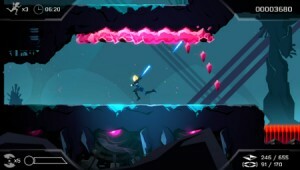 Recently I’ve been playing Velocity 2X – one of the more recent games from Brighton-based Futurlab, who also made the excellent Velocity Ultra. In fact, this game is a direct sequel to Velocity Ultra, but with more features and mechanics. In summary, this is a tough, twitch-arcade game that takes place across two main gameplay phases during each level, with each level being connected to the next via a storyline about your character (Captain Kai Tana) attempting to escape some strange alien incarceration and find her way back to her home planet. First there are sections where you must pilot a ship through a 2D vertically scrolling level. However, in addition to the usual 2D shoot’em up staples of obstacles to destroy, weapons and energy to collect and aliens to destroy, your ship is also capable of transporting short distances and throwing bombs forward, backwards and to the sides. 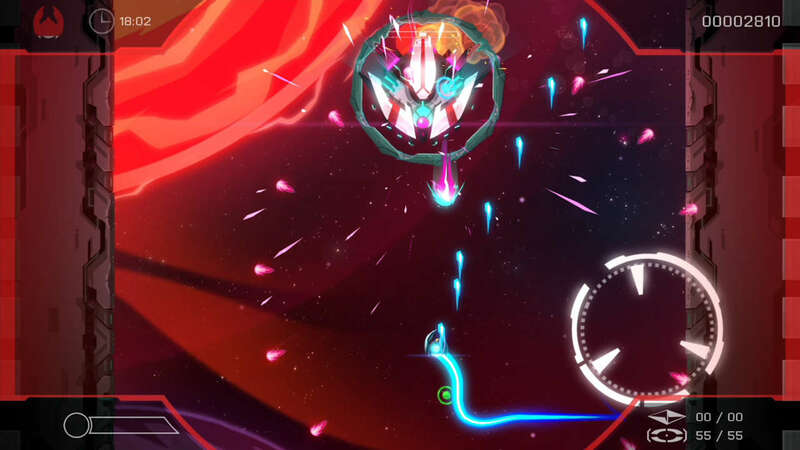 It’s the quick transport and bombs that lead to the enhanced complexity of Velocity Ultra, since the former can be used to travel across walls and into otherwise unreachable spaces, and the latter can be used to not only destroy aliens but to also hit switches (in order) to disable shields that block your path through the level. You also have the ability to drop a pod in certain locations so you can teleport back there from a long-distance away in the level. This also means that the levels can sometimes become complex and branching, meaning you follow through certain parts of the level and then return to a branching point to explore other branches. Secondly, there are sections where you must disembark from your ship to run through 2D side-scrolling levels which use many of the same mechanics that you do with your ship – directional lasers, short-distance transport, plus the pod dropping at key intersections/branch points. The level design is absolutely outstanding. It begins with well-crafted tutorials that always give you the information that you need but are never heavy-handed. Many of the new features are pre-empted by the short but well-written dialogue in the still frames that give the narrative between each level, with brief messages popping up to tell you how to use those features. 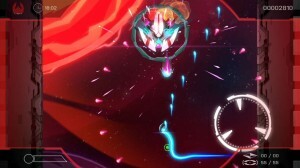 Beyond this the levels are well-crafted to train you how to use the new features, but it won’t be long until Futurlab are throwing ever more crafty and taxing situations at you where you have to combine several of your ship and avatars abilities together to proceed. It’s not often that I feel compelled to replay levels in order to maximise my performance, but I do when playing Velocity 2X. Each level has several ratings to give you and an overall score for how well you performed on the level. After you’ve completed it once it’s difficult to not have another go straight away to see how much better you could do…and another….and another. For someone who tends to just blast through games to finish them and move onto the next one, that’s quite an achievement! Velocity 2X keeps this up across a variety of levels which never become old. There’s always just enough variety to keep you interested and just enough extra challenge through new combinations of the mechanics to keep you going. Controls are smooth and responsive in both ship and flight sections and you get great satisfaction from solving the puzzles that they present to you; even though you’ll rarely need much cognitive effort to solve them, you get that kind of satisfaction from all the parts ‘falling into place’ regardless. Finally, the accompanying soundtrack is excellent with fast paced drum and bass grooves underscoring the speedier sections and more beating electronica helping you focus through the rest of it. A well-rounded, well-designed game that every Vita owner should experience!